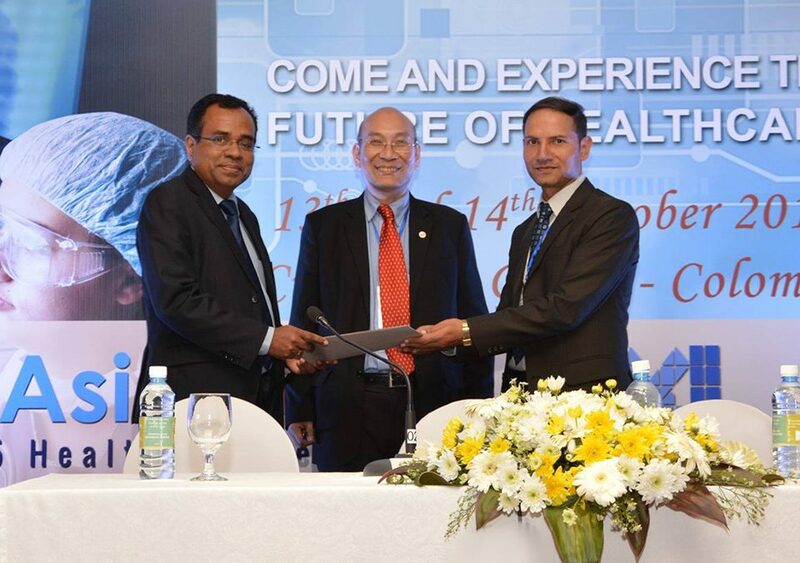 A memorandum of understanding was signed between Health Informatics Society of Sri Lanka and School of Engineering, Kathmandu University, Nepal during the eHealth Asia 2015 conference held in Colombo, October 2015. The main objective of the agreement was to provide resources and technical assistance to establish a masters degree programme in health informatics in Kathmandu University. Health Informatics Society of Sri Lanka is a regional stakeholder in health informatics with its partnership with the Asia eHealth Information Network for eHealth Asia annual conference and Asian Journal of Health Informatics. It is also supporting the Masters in Biomedical Informatics course of Post Graduate Institute of Medicine, University of Colombo, Sri Lanka and Ministry of Health, Sri Lanka with its expertise in health informatics and digital health. The picture shows Prof. Vajira H. W. Dissanayake, President, Health Informatics Society of Sri Lanka and Prof. Rabindra Bista of the University of Kathmandu exchanging the MOU in the presence of Dr. Alvin Marcello, President, Asia eHealth Information Network.